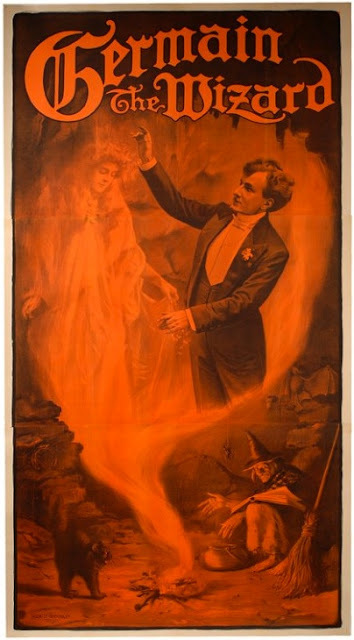 As far as posters go, the above image is one of the most striking magic posters ever created. I still recall the first time I saw this poster in real life. It was at the American Museum of Magic many years ago and I was dumbstruck by it's beauty. It was at this point that my fascination with Charles Mattmuellar began. 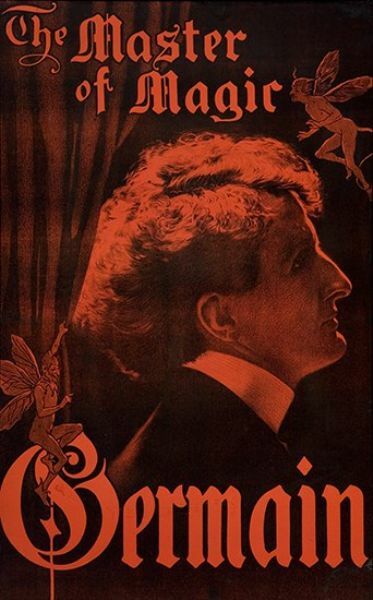 He was born Feb 12, 1878 in Cleveland Ohio. His first magic show was a bit of an impromptu thing where he presented a 'spirit cabinet' like effect for some friends. He was eight years old at the time. His mother forbid him to pursue the magical arts, but he did anyway. Eventually, his father recognized the talent that the young boy had and Mattmuellar the Magician was born! In grade school Charles became known as Karl because of the number of other students in his class named Charles. The name stuck and he kept it for the rest of his life. As a magician, he would first use his last name Mattmeullar and then for a very short period use the name Alexander, after his idol Alexander Herrmann. However, when Karl had the opportunity to move into the Lyceum circuit, he was encouraged to alter the name again because there were already a multitude of 'Alexanders' in the show business world. Karl chose the name Germain, after the Marquis of St. Germain, a mystery man and mountebank. At first a mistake in spelling in an advertisement caused the name to be spelled 'Germaine' with an 'e' on the end but eventually he dropped the 'e' and used Germain. He would also eventually drop the term 'magician' in favor of 'the Wizard' to round out the name. was his mother who apparently handled his money, at least in the beginning and did so well investing it that Germain was able to live off it throughout his life. His sister Ida became part of his act, becoming an assistant when he presented his mind reading routines. Finally, and probably most importantly, it was his father Charles Mattmuellar Senior who deserves a great deal of credit in the success of his son. His father helped build the famous Germain Flower Growth Illusion, using both carpentry skills and wood carving skills. They would build many versions and adaptations of growing flower tricks over the years. One of their creations was the forerunner of the Square Circle effect and a clever improvement to the Kellar Flower Growth routine which was then adopted by other performers. I would imagine his father also built the first Wooden Block Thru Board Illusion and many of the other signature effects, possibly even the Germain Spirit Lock. I do know for a fact his father built the Germain Spirit Dial, which was a popular effect with magicians of the time, but Germain's prop was built by his Dad. 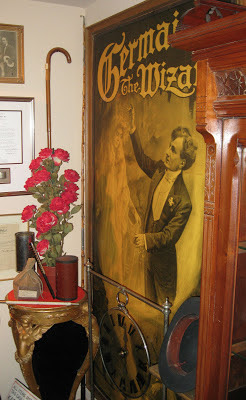 The Flower Growth and the Spirit Dial can both be seen in the photograph to the right. Ken Klosterman owns a great deal of the Germain props and has a very extensive collection of Germain posters. I believe a second Germain Flower Growth is in the David Copperfield Collection, given to him as a gift from Mr. Klosterman. And recently, I learned the Germain Spirit Lock resides in Tim Moore's Magic Collection. There is much to share about the life of Karl Germain as he truly was an amazing Wizard. At another time, I'll delve deeper into his effects and in a future article I'll share some stories of his life and the tragic turn near the end of his life.